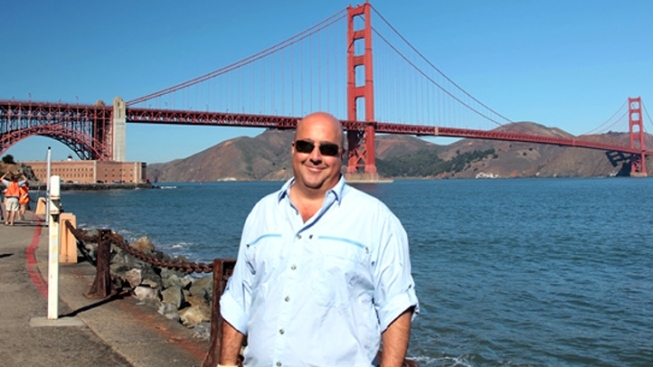 Andrew Zimmern poses in front of the Golden Gate Bridge. Ever wonder how those who can't afford to eat at the Michael Minas and Gary Dankos of the City eat? Andrew Zimmern has. The host of the Travel Channel's "Bizarre Foods" latest episode was filmed in San Francisco, which airs Tuesday night. And instead of just exploring exotic, or hard to digest foods, like Zimmern often does, the host takes a look at how the homeless in the City survive. The episode features Zimmern searching for edible bugs in the City, dumpster diving for food and more. He also takes some time out to visit local food trucks and restaurants. And if checking out a national show tour our city wasn't enough motivation to plop down on the couch, the Travel Channel is giving us all something to feel better about being lazy. For every person that watches the show, the Travel Channel will make a donation to the 100,000 Homes Campaign for every person that watches. Check the Travel Channel's website to find out when the show is airing next.